THE conversation started with prints. We embarked on a discussion about the works of four great masters of prints in Bangladesh. His artistic enthusiasm matched my curiosity, as we talked about galleries, art, and painters over a cup of coffee. The entrance to Gallery Winners is quite out of the ordinary. Made from recycled wood, the black piece of timber standing almost nine feet high requires quite a force to push open. But once in, the ambience inside is set to please. "If collecting art is a journey through imagination and creativity, galleries serve as a fuel station. It was my long time dream to create a private gallery for my collection, but it was the insistence of the painters that worked as the driving force behind consequent realization of the dream," say Syed Durjoy Rahman, the man behind Gallery Winners. According to Rahman, Winners is not a gallery of art only, it is a shrine for art in visual form- paintings, sculptures and photographs. The material on display is primary from his own collection from Sultan, to Qamrul to a new generation of artists like Md. Iqbal. His fascination for prints is obvious and so is his devotion to meticulous search for work by all the giants in the field. Nurturing a sense of art, to carry it, and see through a metamorphosis takes effort. It is not important that everyone becomes an art collector, but the appreciation of art should be within every enlightened soul. Art brings colour not only to our rooms but also within our souls. Winners houses a café, a corporate office and the third floor is dedicated to exclusively to the gallery. But the presence of art is everywhere. 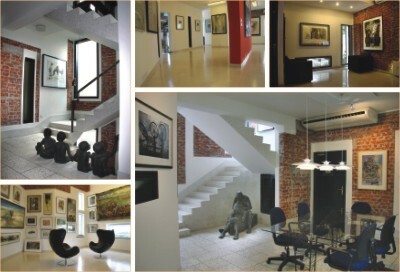 Commissioned sculptures, works in etching, oil and watercolour decorate the walls of the office space. The two large rooms of the third floor dedicated exclusively to celebration of art have been designed to present two different flavours. While a space is dedicated to showcase and highlight individual paintings, another room takes the form of an 'art shop', where works of great masters form a collage. The 20 feet high ceiling adds to the grandiosity of the room, and makes the experience of seeing some of the most important works of Bangladeshi art under a single room is simply exhilarating. Syed Durjoy Rahman likes collecting long series done by notable artists. He also has a knack for collecting 'experiments' of noted masters. 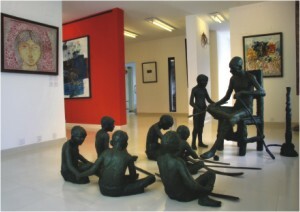 In recent years, the Bangladesh art scene has seen quite a commotion. Good pieces have fetched steady prices, audiences at galleries and art exhibition have been promising. As the field matures, it is hoped that more and more people will be drawn into the art circle. Galleries like Winners will prove vital to nurturing and generating the knack for art.